Refugee, writing home, Montjuic, Barcelona, November 1936 © David “Chim Seymour. The Mexican Suitcase. When I was in Arles photo festival last year, I met a photographer who introduced me to a book that he just purchased, titled: “The Mexican Suitcase.” He was jumping up and down with excitement, barely able to contain his enthusiasm. I was curious what made the book so unique– and I inquired. He then told me the incredible story of the “The Mexican Suitcase“, which were 3 boxes containing more than 4,500 negatives, covering the entire history of the Spanish civil war from 1936 to 1939 which went missing for over 70 years. The negatives included the work of Robert Capa, Chim, and Taro– and gave priceless insights into their working methodologies. So how did they discover this collection of negatives? Well, the negatives were owned by a man named Benjamin Tarver, a Mexican filmmaker who inherited the negatives from his aunt, who had received them from her relative, General Francisco Aguilar Gonzales, the Mexican ambassador to the Vichy government in France in 1941 and 1942. Nobody has any idea how General Aguilar acquired these negatives (which is part of the great mystery). At the end of the day Tarver generously decided to donate the negatives to the families of the photographers, whom in turn gave the negatives to the International Center of Photography to study and preserve them. Not only that, but the aging Cornell Capa was able to finally see the negatives (which he never expected to see again after losing them). The “Mexican Suitcase” is a bit of a nismoner as it isn’t really “Mexican” (the photos were of the Spanish Civil War, but discovered in Mexico), nor is it a suitcase (they actually were organized in boxes and folders). But somehow the name stuck. The book is published by in collaboration with the International Center of Photography and Steidl, and comes in a lovely two-book volume. The first book is a collection of essays which gives a bit more insights on how they discovered the Mexican Suitcase, how they processed the films, and some insights we could learn from the working styles of the photographers themselves. The second book is much thicker, and contains all 4,500 negatives. It is over 400 pages long, and put together incredibly well. Not only does each contact sheet show the location where the photos were shot and who photographed them– they also give a commentary on the story behind the shot as well as some insights into how the photographers composed and framed their images. I haven’t had the chance to go through the entire second book (it is a lot to take in at once)–but I plan to slowly work through it the next several months. However what I wanted to share was some insights I learned from the first book, on the essays of why the work of Capa, Chim, and Taro was so influential when it came to photojournalism and photography as a whole– and how we as street photographers can apply it to our own craft. In the first essay in The Mexican Suitcase titled: “Rediscovering the Mexican Suitcase” by Brian Wallis, he describes how radical the work of Capa, Taro, and Chim was for their time. Their photography and working style created a new form of “visual journalism” which was a new way of seeing for the time. To capture these elements in a photograph is incredibly difficult, and rarely happens. However whenever these three elements do come together and coalesce, they make for a brilliant, gut-wrenching, and memorable image. I think as street photographers we can strive to capture the same elements in our photographs. As humans, we are drawn to novelty and things that are out of the norm. Therefore when shooting on the streets, to capture dramatic and powerful images is a key to making a memorable image. Not only that, but to tell stories through our images is another key element of making a great street photograph. From the beginning of time, humans have always loved to tell stories as a form of communication. In-fact, telling stories is one of the best ways for us to internalize new knowledge and remember it. Therefore try to apply the same methodology to your street photography: try to create a story in the image. Identify a protagonist, and introduce drama or intrigue to the image. Don’t always tell the whole story, try to leave open some questions to the viewer– to get them engaged and involved. As street photographers, we shouldn’t just be passive observers of street life. Rather, we should be active participants– and engage. I would personally say don’t worry about whether you “interrupt” or “change” the scene. At the end of the day, you will always influence a scene no matter how hard you try to be discrete. The only way you could ever not influence a scene is either by not being there (or wearing an invisibility cloak which also allowed you to walk around in a cloud of formless vapor). People are going to notice us walk on the streets with a camera, look at us, and might even engage with us in chatter. I say embrace that. Talk with your subjects, get to know a community in which you photograph, and become integrated. This is one of the best ways to really get a better “sense of place” and become an insider, rather than an outsider. I would argue this at the end of the day will not only make your photos more personal, intimate, and memorable. I think as street photographers we should be opinionated about the world in which we capture. I don’t believe in any sort of “objectivity” when it comes to photography. It is all subjective. What I find interesting in the streets is not what you would find interesting on the streets. How I frame a scene would be different from how you frame a scene. Whether I choose to crouch or take a step to the left or the right is different from how you might capture a scene. If you see the world as a happy and joyful place, try to highlight that. It might be a reflection of your personality and how you see the world. If you are more of a pessimist, don’t try to cover that up. Try to show that through your photographs. Make your photographs personal, not calculated and sterile like you were photographing in some sort of laboratory. The world is a rich place, full of life, and different shades of emotions. Be true to yourself, and photograph how you see the world. This will be a key step to find your own unique style and voice when it comes to street photography. In the early 20th century, one of the most popular ways in which photographers presented their work was through photo essays. What is a photo-essay exactly? Well, it is a series of images which tell a story which build up a narrative of a scene or event (similar to what you might see in a movie). The great part of photo-essays is that they aren’t just all about the action, but the quiet moments and pauses in-between. “Of all the achievements of their photographic coverage of that war, it is their development of the photo essay that has had the greatest lasting effect. Certainly, these photographers created extraordinary individual images, some which are contained among the newfound negatives, band which have become iconic symbols of the Spanish civil war. But their intention was different: to construct, through a series or sequences of images, an emotionally resonant narrative of events, much like a film scenario or newsreel. This required images of not just the climatic moments but also the quiet ones, the obscure ones, the moments of death and silence. Whereas in the past there was a lot of emphasis when it came to the photo essay, today the single image is far more popular. Think about how we consume media. We look at funny single photos of cats on Reddit, we look at single photos of people’s food on Instagram, we look at single images that are designed to shock and entice people in front of celebrity news tabloids, and so on. I would suspect that the majority of the public doesn’t have the patience for photo essays anymore. Rather, in this day of limited attention (while full of distractions), we want to be pleased by the single, shocking, and powerful image. I think the same applies in street photography. The majority of the social media platforms we use to share our work (Facebook, Flickr, Instagram, Google+, Tumblr, etc) generally put a focus on the single image over sets of images as well. Also due to the fact we want to get lots of “Favorites” and “Likes” on our images, we tend to share them as single images to milk the cow. Although I am a huge fan of powerful and single images, I think that there isn’t enough emphasis on projects with multiple images. Nowadays it is hard to have the patience to work on an extended project for a long period of time. How many street photographers are still around who work on a project for over several years? Therefore I think while we should enjoy taking single-images, we should strive to work on more projects that have more depth and a wider gamut of images. Rather than single powerful images with solid compositions, brilliant light, and shocking content– we should strive to also take photos of the small and quiet moments. Don’t always take photos of just interesting people or scenes, but also of boring ones. Photograph a lonely vase sitting in the street by itself, the discarded toaster, or even a rocking chair waiting for someone to sit on it. When it comes to street photography, I think one of the most important things (not always) is to get close to the action. By getting close to the action, we can get a better sense of what is happening in a scene and become integrated into our images. Not only create visually intimate photographs, but photographs that also tie us emotionally to an image. And this general concept seemed to dictate not only that the photographer be “embedded” with his or her subjects, but also that he or she be part of the action, if not necessarily partisan. I find it fascinating to the parallels between photography and cinema, and to see how both influenced each other heavily. In this case, it seemed that cinema had the stronger influence on photography such as the emphasis on the “close-up”– a technique very common in cinema, but underplayed in war photography. Therefore one way you can become better as a street photographer is not just by looking at photographs, but look at moving pictures. Watch the great classic films by Alfred Hitchcock and Stanley Kubrick as well as more contemporary films by Quentin Tarantino and Wim Wenders. Analyze their films in terms of the movie structure, how the camera angles pan in and pan out, how the actors are introduced to the scene, and how they are able to make moments of a scene dramatic. Some of the greatest breakthroughs in art are often from outside fields, so absorb yourself in many different forms of art and apply it to your street photography. Analyze compositions, framing, perspective, and subject-matter. If you synthesize this all to your own personal work, I can guarantee you that it will be more refreshing, unique, and engaging. Every new year, a new camera comes out. Technology is evolving at a rapid pace. A hundred years ago, we worked with relatively primitive 35mm cameras. Now we have cameras that can shoot at over ISO 12,800 with barely any noise. We can even photograph with our smartphones, edit and post-process it directly, and then send it wirelessly to be shared with the rest of the world. I know a lot of photographers who take a purist approach when it when it comes to technology and photography. Although I shoot film myself, I don’t think that it is necessarily “better” than digital (or vice versa). Rather, I personally enjoy it more. I think as street photographers we should be progressive when it comes to technology and adapt when necessary. It can help us be more creative and expressive when it comes to our work. “Technological advances played an important role in the form and content of illustrated information. Photojournalism, which was born at the beginning of the twentieth century in the liberal Germany of the Weimar Republic, found its true dimensions in the coincidence of advances in print media with the appearance of the rotary printing press and above all, the manageability of cameras. Erich Salomon was one of the first great photographers to work with a small camera, the Ermanox, which could be used to photograph indoors and at night without a flash. In this vein the arrival of the small Leica, invented by Oskar Barnack in 1924, was a decisive advance: it used the standard negative of movie film, which made it possible to take thirty-six photographs in a single reload of the camera. In addition, films were steadily becoming more sensitive [higher ISO performance]. Very soon, the Leica became an indispensable instrument for photojournalists, who, once freed from technological limitations, began to express themselves with style – that is, began to show themselves to be artists, a development that carried with it a significant subjective charge, photographers felt free to cover events themselves, and thus began to give up the role of accompanying a reporter solely as the photographic illustrator of an article. Photojournalism, which Gisele Freund defined as “a story told in images, in which the importance of the text is reduced to a photo caption,” was born. Its practitioners ceased to be photographers and took on a new life as photojournalists. It is clear that without the advances in technology (like that of the printing press or the small portable camera) that photojournalism wouldn’t have been able to make the advances that it did. Imagine shooting a war with a large-format 8×10 camera in the past. Not only did you have to lug around the behemoth (tripods and all), but you had to capture the moment with a single exposure at a time. Not only that, but you would have to work with a very slow film (probably under ISO 25) in which you couldn’t capture any decisive moments like the shrapnel of a grenade, the anxious expression of a soldier in a trench, or the charging of soldiers at the enemy. With the invention of small portable 35mm cameras and the use of 35mm movie film, photographers were now freed of the physical size of cameras which helped them become more nimble in the field. Not only that, but they were able to take more frames of the scene, to capture subtle nuances that were happening and experiment more with framing and compositions. In today’s age, we have all these new and fancy cameras that have advanced the way in which we approach and shoot street photography. We have cameras which have ridiculously fast autofocus (the Olympus OMD and Fujifilm x100s come to mind), cameras with ridiculously high ISO performacne (the full-frame sensor of the Sony RX-1 in a compact body), and the convenience of having a camera that is always with us at all times (iPhones and smartphones). I am a huge fan of new technologies, and how they can be applied to the world– especially to street photography. Although I don’t recommend always going out and buying new cameras for the sake of it, but I encourage experimentation. Try out a new camera which will change your style of working. For example, I am a huge fan of compact cameras– as they are easier to carry around, which generally leads you to taking more photographs. Not only that, but people are less intimidated by you. If you want to do more street photography at night without a flash, use a camera with superior high-ISO performance (if you don’t like noise). If you want to experiment with different forms of sharing, try using the iPhone and publish your photos on Instagram. Try out different forms of post-processing. A full-page spread of Taro’s contact sheet. You can see an explanation and background information about each roll in the top left corner. Click to see a larger full-resolution image. I would say that The Mexican Suitcase is one of the most valuable photography books that you can own when it comes to becoming a better street photographer. Why? 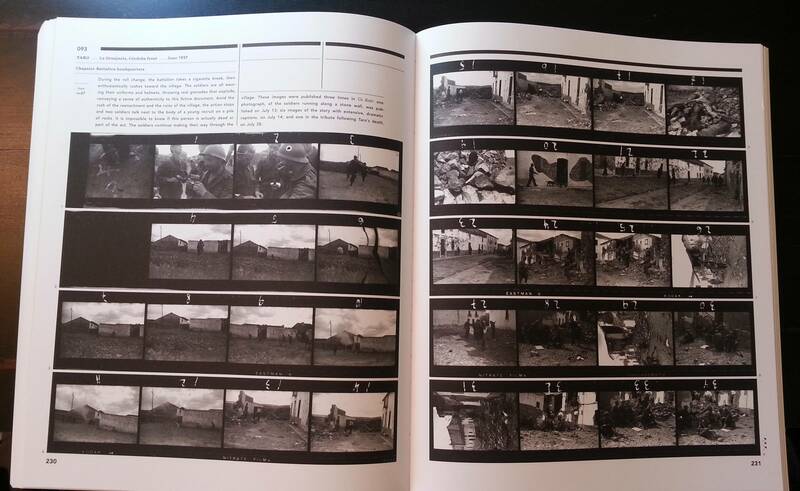 It contains the contact sheets of all of these amazing war photographs by the talented eyes of Capa, Chim, and Taro. For those of you who may not be familiar with a contact sheet, it is pretty much a print made up of all the 36 photos in a roll of film. It allows you to see how a photographer selects a subject (why did he/she decide to photograph this?) as well as how they decided to frame and compose a photograph (why did he/she decide to crouch or take a step to the left or the right? Why did he/she decide to click the shutter at this moment?). “And this is exactly where the original sequence of the negative plays such an important role. To see the magazine or vintage prints, one can engage with the individual image, or sometimes several images of a story. But to view the image within its original sequence is like seeing the sketches for a painting, the cartoons for a tapestry. It is the draft of a writer. One sees how the photographer framed and reframed a subject, their preferred compositional styles, how they experimented with new angles or engaged with several subjects at once, going back and forth between two scenes. One sees what the photographer thought was important to capture on film, even if it was not a newsworthy image, people who traveled with the photographers, signs they thought interesting, spectacular still lifes. One sees technical difficulties. What I love most about looking at the contact sheets of famous photographs is that it humanizes them. It shows that they aren’t just demigods who took one swift click of a shutter and capture “the decisive moment” in one frame. You see the photos they took which weren’t so good, which had poor framing, distracting elements in the background, as well as technical difficulties (a photograph being too dark or bright). But above that, we can learn their working styles and methodologies. We can see how they “worked a scene” and how many photos they took of a certain subject before they thought they “got the shot.” We can see how they experimented shooting horizontal photos versus vertical photos. We can see how they played with different perspectives in a scene– sometimes shooting from a low angle, and other times climbing a building to get the action from above. For more reading on what we can learn from contact sheets, read my post: 10 Things Street Photographers Can Learn From Magnum Contact Sheets. “The Mexican Suitcase” is a must-buy for any street photographer who wants to learn more about composition, framing, and how to better capture a scene or a moment. Although the photographs are mostly of conflict and battles, there are also many lovely street photographs in the book. Even though there was a brutal civil war happening, Capa, Chim, and Taro would still capture lovely street photographs of children drinking milk, playing in the streets, or even of people reading newspapers at cafes. It shows that during the time, it wasn’t just war and terror– there was also moments of happiness, joy, and love. Know that to develop as a street photographer, we shouldn’t just stay in the “street photography ghetto” of just studying specifically street photography images. We need to expand our sources of inspiration by looking at photojournalism, war photography, cinema, fine art, and more forms of visual inspiration. Never stop learning. There was also a documentary made on The Mexican Suitcase. Above is a trailer for the film. You can see more info on the film here. You can watch the film for $9.99 on the iTunes store. You can watch the film on Netflix. Battle of Teruel, Spain, December 1937. Navacerrada Pass, Segovia front, Spain, late May–early June 1937. Outdoor mass, Berriatua, Basque region, Spain, February 1937. “The Mexican Suitcase” is a must-have in your photography library. At ~73 USD, it is a huge bargain. Not only do you have access to thousands of negatives never seen before, but you can study the contact sheets and learn priceless insights on how Capa, Chim, and Taro worked. Trust me, you won’t regret investing in this book. An excellent write-up of the exhibition of “The Mexican Suitcase” in Arles in 2011 by José Manuel Serrano Esparza. Learn more about The Mexican Suitcase at the ICP website.